The Caps started Game 1 without a shot on goal for the first nine minutes of play. Game 2 started with six Capitals shots, and the dividends paid early. Alex Ovechkin faked a slap shot after entering the offensive zone, then passed the puck to Nicklas Backstrom who beat Petr Mrazek backdoor. With an assist on the goal, Ovechkin is now riding an eight-game playoff point streak, dating back to Game 7 of the Eastern Conference Final against Tampa Bay in 2018. T.J. Oshie added a second tally with a forehand-backhand deke to beat Mrazek. It’s Oshie’s first goal of these playoffs. Carolina cut the lead in half when Lucas Wallmark deflected a Jaccob Slavin shot. The Caps challenged for goaltender interference but the goal stood. It’s Wallmark’s first career playoff goal. The Hurricanes have 11 players making their playoff debut in this series. To start the second period, Micheal Ferland hit Nic Dowd high and was assessed a five-minute major and a game misconduct. But the Caps couldn’t convert, and the Hurricanes also couldn’t convert on an ensuing 5-on-3 power play. Sebastian Aho tied the game when he banked a shot from behind the net off Braden Holtby, with just under four minutes to go. It’s Aho’s first goal since March 9. The Caps pulled ahead 3-2, with 10 minutes remaining in the third. 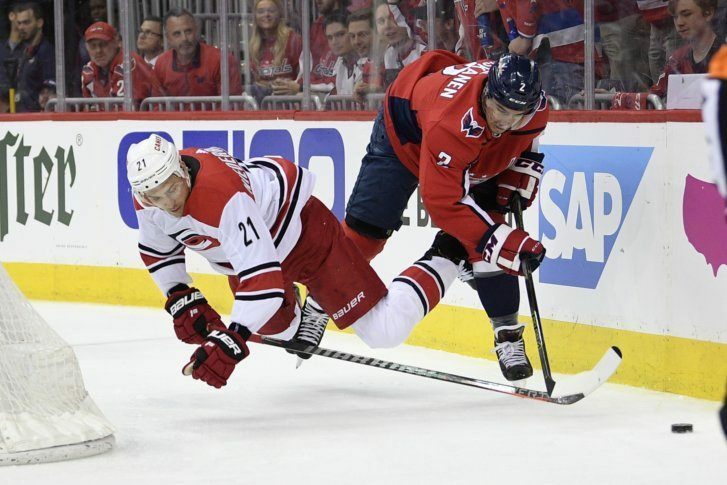 Ovechkin again initiated the play when he caught the puck out of midair in the defensive zone, zoomed up ice, then fed Tom Wilson for a cross-ice feed that beat Mrazek on the low blocker side. Jordan Staal drew a high-sticking penalty on Nic Dowd, and Staal deflected a Dougie Hamilton point shot to tie the game at three. In overtime, Orpik played hero with a bomb from the point. It’s the 38-year-old’s first goal of the playoffs, and third for the entirety of the season. The game was the second playoff game this postseason to go beyond 60 minutes. Listen to the highlights of Game 2.